I have not been critical of Newt Gingrich but it is now time to take a stand before it is too late. If Gingrich is the nominee it will have an adverse impact on Republican candidates running for county, state, and federal offices. Hardly anyone who served with Newt in Congress has endorsed him and that fact speaks for itself. He was a one-man-band who rarely took advice. It was his way or the highway. Gingrich served as Speaker from 1995 to 1999 and had trouble within his own party. By 1997 a number of House Republican members wanted to throw him out as Speaker. But he hung on until after the 1998 elections when Newt could read the writing on the wall. His mounting ethics problems caused him to resign in early 1999. I know whereof I speak as I helped establish a line of credit of $150,000 to help Newt pay off the fine for his ethics violations. In the end, he paid the fine with money from other sources. Gingrich had a new idea every minute and most of them were off the wall. He loved picking a fight with President Clinton because he knew this would get the attention of the press. This and a myriad of other specifics like shutting down the government helped to topple Gingrich in 1998. In my run for the presidency in 1996 the Democrats greeted me with a number of negative TV ads and in every one of them Newt was in the ad. He was very unpopular and I am not only certain that this did not help me, but that it also cost House seats that year. Newt would show up at the campaign headquarters with an empty bucket in his hand — that was a symbol of some sort for him — and I never did know what he was doing or why he was doing it, and I’m not certain he knew either. The Democrats are spending millions of dollars running negative ads against Romney as they are hoping that Gingrich will be the nominee which could result in a landslide victory for Obama and a crushing defeat for Republicans from the courthouse to the White House. Democrats are not running ads against Gingrich which is further proof they want to derail Governor Romney. In my opinion if we want to avoid a sweeping victory by Obama in November, Republicans should nominate Governor Romney as our standard bearer. He could win because he has the requisite experience in the public and private sectors. He would be a president in whom we could have confidence and he would make us proud. Dole's statement comes during a wave of Gingrich-bashing by other conservatives, including, most recently, by former House Majority Leader Tom DeLay. DeLay -- a central figure in both Gingrich's 1994 GOP House takeover and later the 1997 "coup" that ultimately lead to Gingrich's resignation -- said during a radio interview Wednesday the former House Speaker is "not really a conservative." "What has been said about Newt is pretty much true — he had to step down because the Republicans, the conservative Republicans wouldn't vote for him again as Speaker," DeLay told conservative talk radio host Michael Berry on Houston's KTRH. "He's not really a conservative," DeLay continued." He'll tell you what you want to hear, he has an uncanny ability sort of like Clinton to feel your pain and know his audience and speak to his audience and fire them up. But when he was Speaker he was erratic, undisciplined." 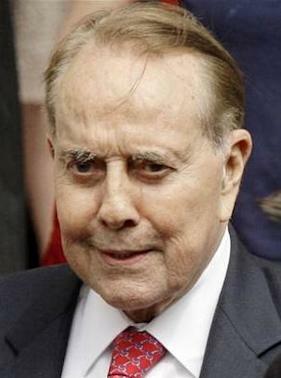 DeLay was forced to resign from Congress in 2006 following an indictment on money-laundering charges. He was convicted in 2010 and subsequently sentenced to three years in prison, but is free on bail as he appeals his conviction.